Kathryn’s PhD research involved two projects. She was the first to obtain Raman spectra of molecular monolayers under high pressure in a diamond-anvil cell, by developing tiny photonic sensors that amplify the monolayer spectra by factors of about 100,000. In addition she developed a laser-launched flyer plate system that propels metal foils at speeds up to 4.5 km/s, and used this method to study the emission from molecules in polymers and from impact-initiated energetic materials. 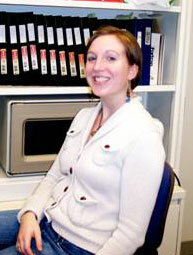 At Los Alamos, Kathryn will be continuing her work on ultrafast spectroscopy in collaboration with David Moore.